Yep! An embarassment of puzzles! Happy New Year Everyone - I hope 2013 brings health, happiness and friendship to you all! and some more puzzles!!! Last New Years Day I posted a quick review to show how much my collection had improved and said that it had gone from a bit of a hobby to a rather bad habit! Well, I'm afraid that according to the first wife it has gone from a bad habit to an all encompassing obsession! Unfortunately, I have to agree with her - I decided to create a proper database to keep track of it and stupidly included prices (complete with currency conversions) and got a bit of a shock. Actually it was a LOT of a shock!! This is now a definite obsession! Not to be left out, the present Mrs S decided that if I can have a collection, then so should she and she was delighted to tell me that Santa lived in a Mulberry store as yet another handbag entered the house for Christmas - apparently that was my Christmas present to her! I justify my puzzling as a way to keep the mind busy - Alzheimer's dementia does run in my family and so I always claim to her that I am just fending it off - that way, the date at which she will be having to feed me and wipe my bum will be delayed (hopefully forever); I knew there was a reason I married a professional nurse!! I also use my puzzles to keep some of my patients occupied during operations carried out under nerve block or spinal/epidural. They all seem very grateful and some have even requested to be anaesthetised by me again so they can try some more puzzles! I wonder if I can claim them as a business expense? My family are barely tolerant of my "habit" - my own mother hates it! She thinks that I should have grown out of toys by now. Although my mother-in-law seems to be fascinated. At a recent visit, she spent several hours playing with everything from packing puzzles, to wire jingly things, to wooden interlocking cubes! Mrs S does agree that my habit is marginally more acceptable than me buying a menoPorsche and getting a 20 year old girlfriend and to be honest, I don't have the energy for either of those - or the cash!! My problem - lack of space! There's still some space - I think I need more twisties! What has been the puzzling highlights of 2012? Well that is really difficult to say. Primarily it has been the community of people I have come to know and consider friends (even though I have never met them!) but if I limit it to a few puzzles I have acquired then firstly I was really proud to get one of the very last of Brian Young's Opening Bats. It took me a couple of months to complete it and at a recent mini puzzle party I held at home, one of the guys had a fantastic time working through it (with a little encouragement). The tremendous craftsmanship was hugely admired, especially Brian's ability to work in metal as well as wood. I am really looking forward to receiving the 2012 limited edition set in 2013. I'm drooling just thinking about it! Another set of acquisitions came from Scott Peterson, whose tremendous accuracy has to be seen to be believed - some of his pieces are so well made that it can take quite a while to find any joins and then find the first piece to remove. What-is-more, the points on some of the puzzles are actually sharp enough to stab yourself! You can't even see the joins! I can't help but buy a large batch each time! I do try to spread the solving out! OMG - How many bloody cubes are there? Bank account now empty - again!!! I have barely scratched the surface! There's Vinco, Stickman and Wil Strijbos too! I have also bought loads of twisties including handmade puzzles by Traiphum and Hawk. If I have missed any craftsmen then I do apologise - I am swamped in lovely puzzles and can't keep track easily. Let's hope that 2013 brings more fabulous work from more amazing craftsmen and hopefully starts me making some of my own. Thanks Allard! I agree it's a collection - therefore I need more, More, MORE! At least I'm not as bad as Nigel (whose children have had dry bread and water for Xmas to finance his "problem"!! Hi Kevin Ive been on the wood wonders site where he is having an end of year sale and bought theTriumph (Designed by Stewart Coffin). I have just been back on his site and most have gone. 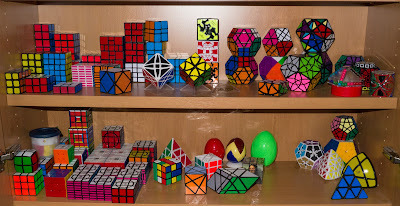 Have you been buying more puzzles LOL. Been sorting workshop out all christmas, should be in a position to start having a go at making some puzzles soon. Hi Neil, I might have been to Wood Wonders - I can't possibly say! I actually already own most of Brian's puzzles. I'm looking forward to your workshop being ready then you can teach me how to make puzzles. Drawer! I never thought of that! Should be a good way to keep some of my small twisties! 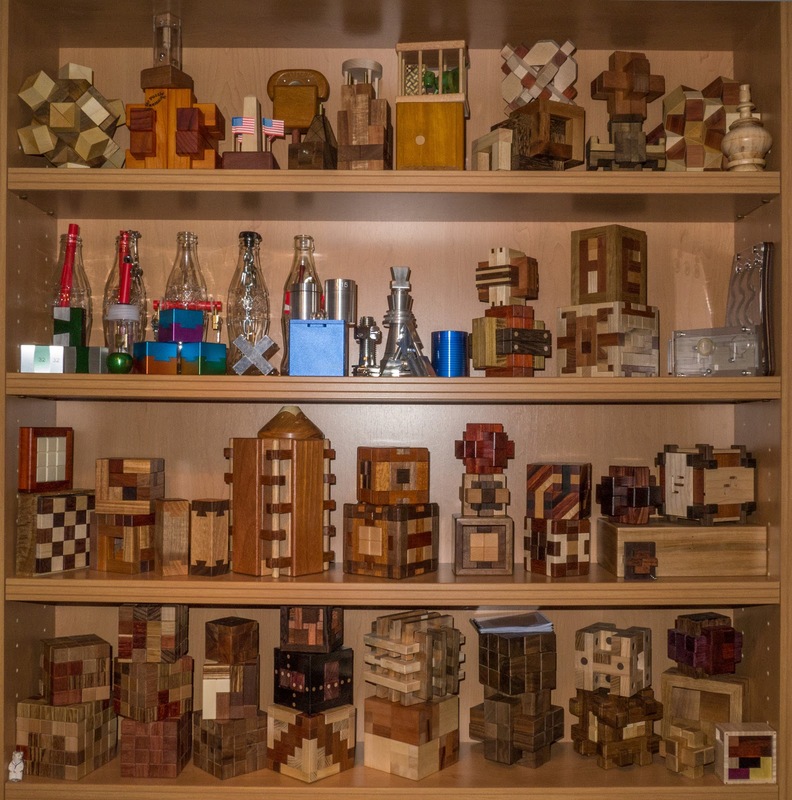 You really like wooden puzzles! 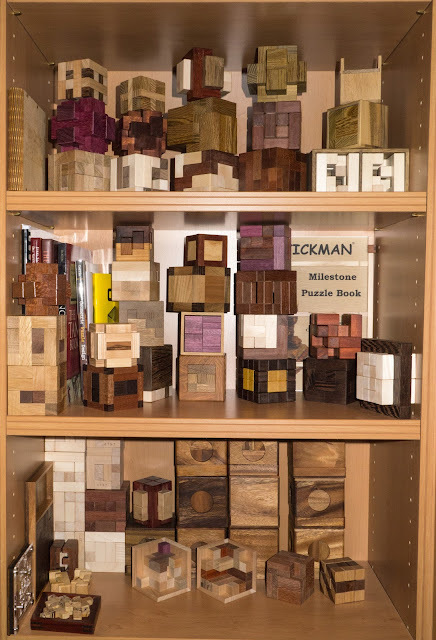 I mainly focus on twistypuzzles but still have little quantity wooden puzzles. Some of them are from Brian Young too. and some are japanese puzzle box. What would you recommend to me, a junior wooden puzzle lover? Otis, I'm glad to see you read my blog! Yes the drawer is a great idea - it was a last resort when I seriously began to run out of space. 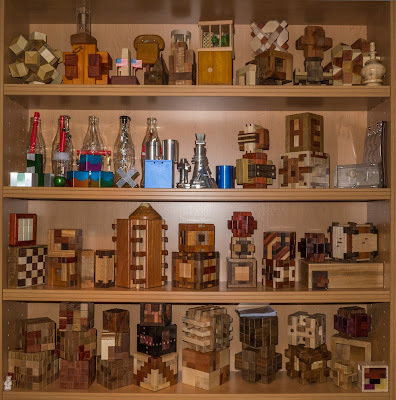 For wooden puzzles for a "beginner" then you should look at Wood Wonders, Cubic Dissection, as well as any of the puzzles by Brian Young. You are on exceptionally skilled puzzler so should try some of the complex ones! I'm told the puzzle boxes from Karakuri are good but I am staying away from boxes to save my finances! My wife NEVER reads my blog! Thank heavens! Thanks Kevin. Actually I will take a look into those famous puzzler blog like yours, IPP & other puzzle frustration, Oli's mechanical puzzle blog, Gabriel's puzzle collection, Brian's Damn puzzle blog, Neil's puzzling part......such kind of them, eventually. You know, my english is not that good, that's why I'm not always watching. Boxes from Karakuri is good I can tell you. Such an artistic puzzle! The wood used, the building, the mechanism inside it, they all fit a puzzler's expectation. May be you should try some before buying them. And thanks for the website advised for me! Very nice write-up. 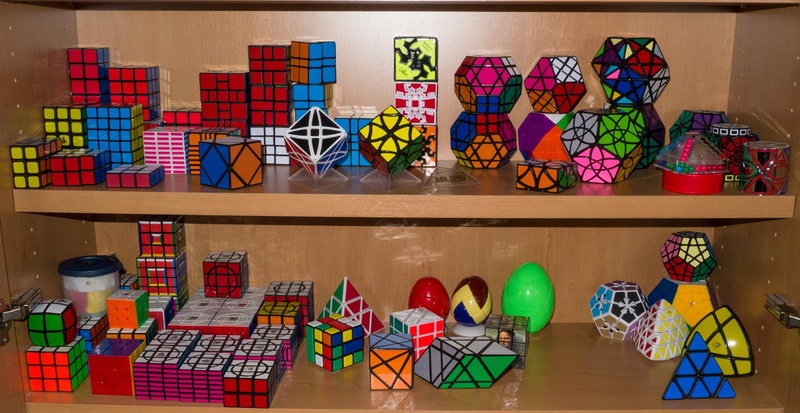 Great to read and to see many of the puzzles that also found their way into my collection this year. I stand corrected by a much much greater collector than myself! I did want to buy some of Jack's higher level burrs for my collection but they do not seem to be available anywhere! A shame because his craftsmanship is superb! Indeed, it is! :) The level 152 is by Jack, and then there is the level 151 by Alfons. His craftmanship is excellent, too. Maybe if you go to Dutch Cube Days, you might run into Jack and you might be able to buy one of his puzzles. That was where I got my latest additions in the "Jack Krijnen" category. I do hope to go to the next Dutch Cube Day next year (and maybe even the German one too). Hopefully Jack will have something for me then.